The EU Strategy for the Danube Region (EUSDR) is a united response to challenges affecting an area which stretches from the Black Forest to the Black Sea, including over 100 million inhabitants. Many of the region’s problems know no borders: flooding, transport and energy links, environmental protection and challenges to security all demand a united approach. The 14 countries in the region, with the support of the European Commission, are cooperating to develop projects and actions that meet these challenges and build prosperity in the Danube region. 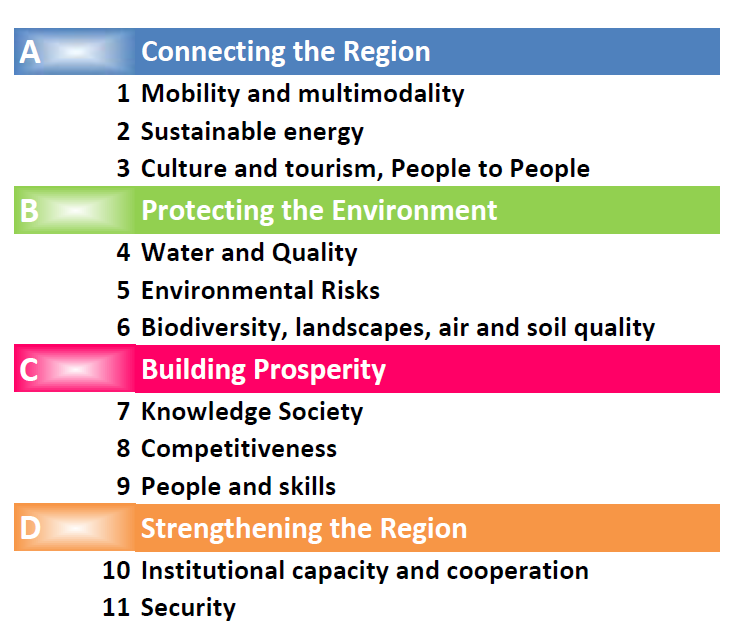 The Danube Region Strategy addresses a wide range of issues; these are divided among 4 pillars and 11 priority areas (see image below). Each priority area is managed by 2 Priority Area Coordinators (PACs). To find out more about the role of PACs, please see ‘What is the EUSDR?’. To read the June 2012 Implementation Report for each Priority Area click here. Priority Area 1A “To improve mobility and intermodality of inland waterways” is coordinated by Austria and Romania. Priority Area 1B “To improve mobility and intermodality - rail, road and air” is coordinated by Slovenia and Serbia. Priority Area 2 “To encourage more sustainable energy” is coordinated by Hungary and the Czech Republic. Priority Area 03 “To promote culture and tourism, people to people contacts” is coordinated by Bulgaria and Romania. Priority Area 4 of the EUSDR “To restore and maintain the quality of waters” is coordinated by Hungary and Slovakia. Priority Area 05 of the EUSDR “To manage environmental risks” is coordinated by Hungary and Romania. Priority Area 06 “To preserve biodiversity, landscapes and the quality of air and soils” is coordinated by the Land Bavaria (Germany) and Croatia. Priority Area 07 “To develop the Knowledge Society (research, education and ICT)” is coordinated by Slovakia and Serbia. Priority Area 08 “To support the competitiveness of enterprises” is coordinated by the Land Baden-Württemberg (Germany) and Croatia. Priority Area 09 of the EUSDR “To invest in people and skills” is coordinated by Austria and Moldova. Priority Area 10 “To step up institutional capacity and cooperation” is coordinated by the City of Vienna (Austria) and Slovenia. Priority Area 11 of the EUSDR “To work together to tackle security and organised crime” is coordinated by Germany and Bulgaria.